When you use Google to sign into Pokémon Go, as so many of you have already, the popular game for some reason grants itself (for some iOS users, anyway) the highest possible level of access to your Google account, meaning it can read your email, location history… pretty much everything. Why does it need this, and why aren’t users told? [UPDATE: the company now says it’s fixing this bug, and that it never accessed anything beyond users’ Google account information]. Well, of course, Go already requires a gaggle of permissions — but you can see the reasoning behind them. It needs to get your fine location, access the camera and motion sensors, read and write to the SD card, etc…. and, of course, charge you money when you run out of Pokéballs or eggs. We’ve asked for answers, but in the meantime, here’s a mystery you, the reader, can help us solve. 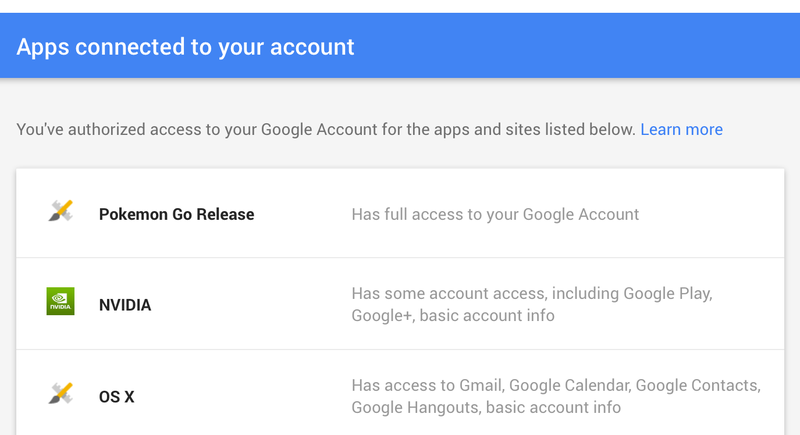 Full Google account access only happens some of the time. For example, on two phones I installed the game on, running Android 5.2 and 6.0, it hasn’t requested any access at all! (Which may be why I didn’t get a 2-factor authentication notification) — but on one colleague’s phone, also running 6.0, full account access right off the bat. And it appears to happen on some iPhones but not others. Is there a pattern here? You can always sign up using a Pokemon Trainer account — except the servers have been so slammed that many people haven’t had that option, and opted for Google instead. Now, to be clear, we’re not suggesting Niantic or Nintendo is harvesting your emails or sucking up the files in your Google Drive. But there’s no reason why this access should be requested in the first place, and there’s no way to modify it (revoking privileges just crashes the game or signs you out). And perhaps more troubling is that it’s both asked for and given without notifying the user. It could be that getting some specific location or payment info couldn’t be figured out in time for launch on certain phone/OS combinations, and as a stopgap measure the developers just requested the whole account. We’ll know more soon, but in the meantime feel free to comment below with your phone and OS and whether full access has been granted (you can check here) — and, of course, brag about all the Pokémon you’ve collected. UPDATE: The makers of Pokémon Go released a statement saying that will address this permissions issue, and that the app had not accessed anything beyond users’ basic account information.